Customer reviews consist of a 5 star rating system as well as comment section for products. 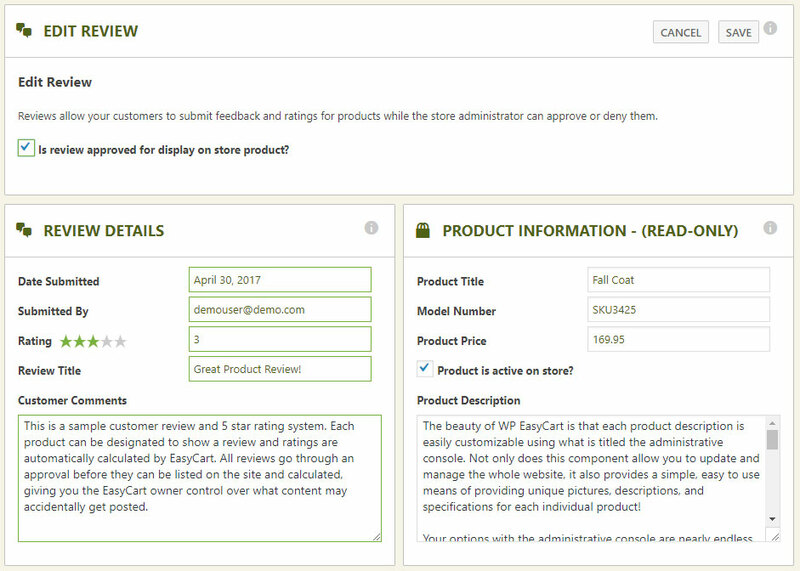 You can enable/disable the customer review system at the product editing level. As customers leave reviews, totals are calculated at the product level to give overall ratings and list comments. All customer reviews will come into the system and require ‘Approval’. This will help stop unwanted spam and insure you get reviews on the storefront displaying that are appropriate and add value as needed. Simply open a review, check if you want it approved and save. It will then be displayed on the front end. If you needed, you may adjust the various parameters within the review such as check spelling or adjust the review date.